Situated in THIS HIGHLY SOUGHT AFTER LOCATION OFFERED WITH NO CHAIN AND WITHIN EASY REACH HEMEL MAINLINE STATION and Boxmoor village centre. A three bedroom town house in NEED OF UPDATING. Comprising. Entrance hall. Downstairs WC/ UTILITY. Study/bedroom. LOUNGE DINING ROOM. KITCHEN. Two double bedrooms and a BATHROOM. INTEGRAL GARAGE. Gas central heating and UPVC DOUBLE GLAZING. Set within recessed storm porch, a glazed front door with side panel opens to the entrance hall, stairs to the first floor, storage cupboard, phone point, door to the garage. Comprising low level WC, tiled surrounds, space and plumbing for washing machine, wall mounted gas boiler serving central heating and hot water, double glazed window to the rear. Stairs to the first floor, access to the lounge diner. 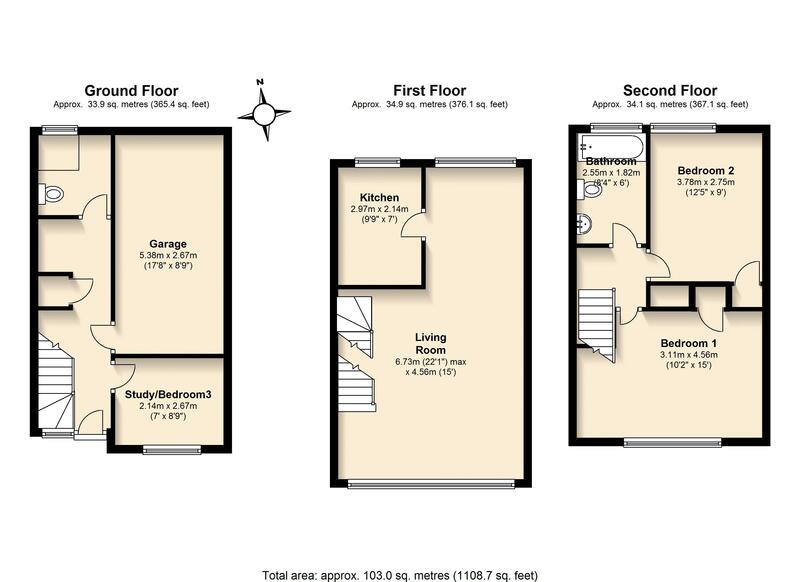 Set in two defined areas, double glazed window to the front, radiator, TV point, staris to second floor. Base and eye level storage units, work surface areas, gas and electric cooker points, single drainer sink unit set below double glazed window to the rear, tiled surrounds. Stairs to the second floor landing, access to the loft space via pull down ladder, storage cupboard. Double glazed window to the front, radiator, built in wardrobes, with hanging rail. Double glazed window to the rear, radiator, built in wardrobe with hanging rail. Comprising low level WC, pedestal wash hand basin, bath, tiled surrounds, double glazed window to the rear, radiator. An integral garage with up and over door, power and lighting, courtesy door to the house. An open plan front garden.